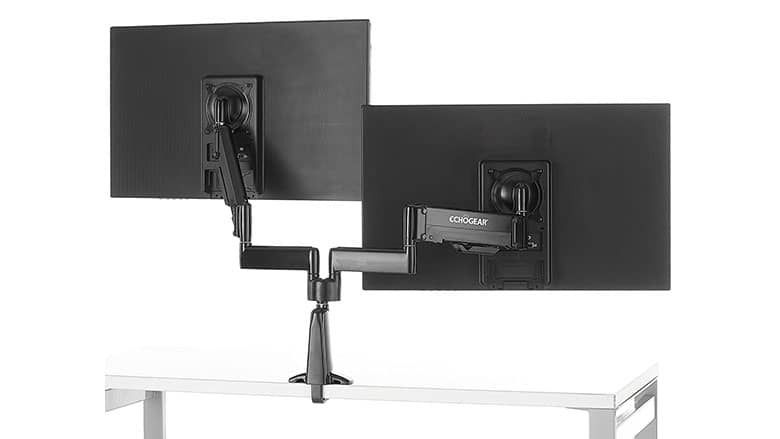 Echogear Dual Monitor Dynamic Height Adjustable Mount | Nerd Much? There are so many monitor mounts on the market now that anything new that comes out isn’t too exciting. After all, you’d think if you’ve seen one mount you’ve seen them all, right? We used to think the same, but last week we replaced our old monitor mount with the new Echogear Dual Monitor Dynamic Height Adjustable Mount, and now we’d never go back. It’s a simple-enough design that allows you to position your monitors virtually however you’d like with ease. When you want to lower it, it lowers exactly how you want it to, and when you want to tilt it, it tilts. It has many joints, including in both the arm and where the monitor attaches to (which uses a unique sliding mechanism to make turning your monitor easy as well; there’s no need to take your monitor off the mount and re-attach it how you want. You can turn, tilt, swivel, and everything in between, and it’s this sort of versatility that makes this a great mount option for Twitch streamers especially. First, and foremost, setup is an absolute breeze, despite being a bit daunting when you first open the box. We had this thing put together in less than 25 minutes, including with both monitors fully attached. I’ll also note that the instructions had a bit of gaming flavor in them, calling what you need for each section “loadouts” and giving you perks as well. The layout of the instructions made it easily followed, so even if you’re not all that great at putting stuff together, you likely won’t have a problem here. It made putting the mount together slightly better than other basic directions we see everywhere else. Cool. The mounts have an all-black and professional look to them, even providing a great cable management system that keeps everything neat and clean. So if you’re one of those streamers who take pride in his/her setup, you’ll be proud to show this dual monitor mount off as well. The Echogear mount lets you have your monitors side-by-side, stacked, or staggered, and switch things up whenever you’d like to. This is actually my second Echogear mount, as I also have one in my living room for my TV setup (which you guys have seen on our Instagram many times by now). So, know that the quality is absolutely there (or we wouldn’t have bothered with a second, right?). You can find the Echogear Dual Monitor Mount on Amazon and Newegg, or order directly from the Echogear store.